She is a keeper! Vote for Cathy! Support and vote for Cathy McMorris Rodgers. Cathy opposes breaching the Snake River dams, a position long advanced by the political left on the basis that hydroelectric power is "nonrenewable." I suspect that this silly notion is somehow related to the "declining" salon runs. But salmon runs are not declining. According to John McKern, Fish and Wildlife biologist, U.S. Army Corps of Engineers (retired); Fish Passage Solutions, LLC (owner), "From an estimated 85 percent per project survival in the 1970s, per project survival has improved to over 95 percent survival in optimal flow years. Low system survival in years like 2001 and 2015 is due to regional climate changes, not to the Lower Snake River dams." Additionally, the Snake River dams are crucial to our regional economy and our agricultural industry, and produce enough clean, renewable energy every year to power nearly 2 million homes. Hydropower in general produces 70 percent of Washington's energy. The Snake River dams also allow for the efficient, cost-effective, low-carbon transport of goods. Nearly 10 percent of all U.S. wheat exports are shipped through the four Lower Snake River dams. 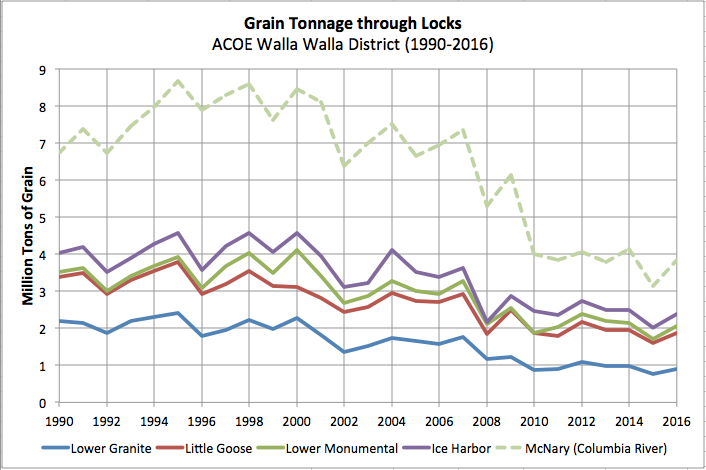 It would have taken more than 43,000 rail cars, or more than 160,000 semi-trucks, to move the goods that went by barge in 2014 (according to Cathy McMorris Rodgers. Many of the Democrats I know are environmental nutcakes. Why aren't they concerned about the pollution that would result from the removal of the dams? Finally, Cathy supports out veterans. Three years in the Army and a year in Vietnam left me deaf. All of my Army buddies had been able to get hearing aids from their local VA hospitals. I wasn't so fortunate. I tried and tried, but for almost three years I was constantly stonewalled. Finally, Cathy interceded and in less than six weeks I had my hearing aids. She also interceded for me on behalf of some of my Social Security Disability and SSI clients who were having difficulty getting their benefits from the SSA. Cathy has been our congressional representative since 2005 and has done an absolutely outstanding job for the people of our 5th Congressional District. Additionally, she is the highest-ranking Republican woman in Congress, serving as the chairwoman of the House Republican Conference. Why in the world would be not want her to continue serving as our congressional rep? She is a keeper! Vote for Cathy!